Any professional installation should begin with a thorough consultation, or walk-through if possible, to figure out the best custom solution for your space. Now’s the time to figure out where you want to install your new theater and how you plan on using it. For example, if your theater will be in a room with large open windows, we’d need to install blackout shades and invest in a screen optimized to work with ambient lighting. Do you also want to use your theater to watch sports? Many sports fans love having multiple screens to follow all the action. We take into account your room size and personal aesthetics to figure out which products would work best and which theater layout makes the most sense. For example, if you want to go with a minimalist style, we can install in-wall and in-ceiling speakers. Depending on the size of the room, we gauge how big your screen should be and where seating should be placed. This is also the time to decide which sources you want to use –like a Blu-ray, media library or satellite box—and whether you want those to be in the room or a dedicated AV closet. Once the planning phase is complete, it's time to begin the installation. The first step is placing the wiring infrastructure. We ensure you have the necessary wiring to connect all of your equipment and that it’s placed in the right location to fit your predetermined layout. If you’re connecting your theater to your home AV system, we use specific cabling and matrix switches to get the signal to you uninterrupted. While retail home theater systems may just be composed of a screen and a few speakers, a custom theater should encompass all the technology in the room. We can connect your system to a smart control solution so you can manage lights, shades and the thermostat at the touch of a button to create the perfect viewing environment. If necessary, we can also add acoustic panels to improve the sound quality within the room. Your theater can also have a unique theme, whether you want it to mimic your favorite team's locker room or a setting from a popular movie. 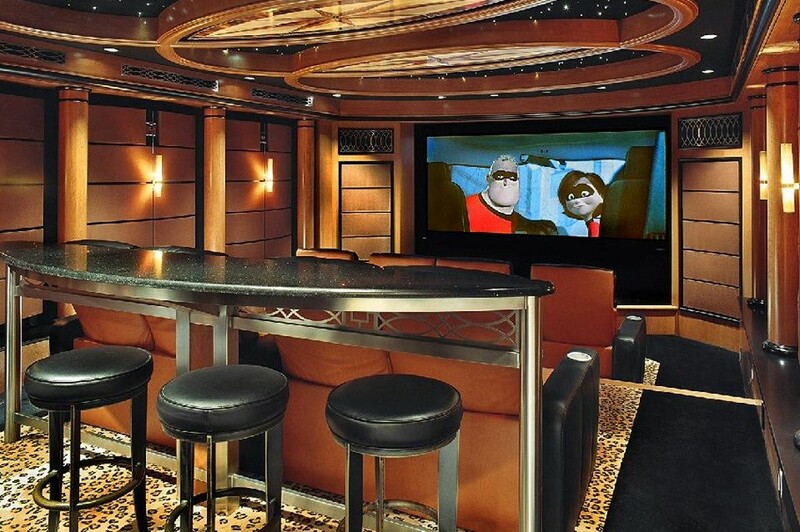 Are you interested in installing a private theater? Sterling Home Technologies can design a custom solution to get the most out of your space.